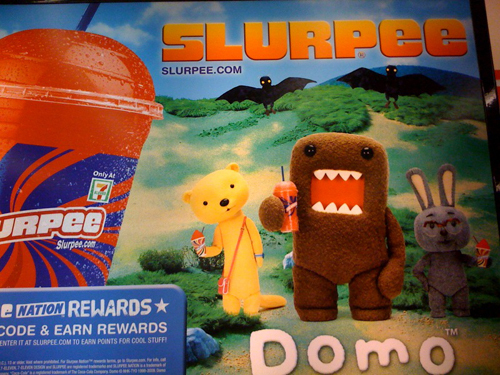 In the past few weeks I have had many blog readers email me and leave me comments letting me know that Domo was on the coffee cups at 7-Eleven. I wasn't sure where there was a 7-Eleven in Rochester, but I couldn't take it anymore so I Googled it. Aaron went with me and sure enough Domo was everywhere inside the 7-Eleven. I didn't see the Slurpee cup or any of the other cool things, but I have another 7-Eleven to check! Thanks to everyone who let me know Domo was making his move! 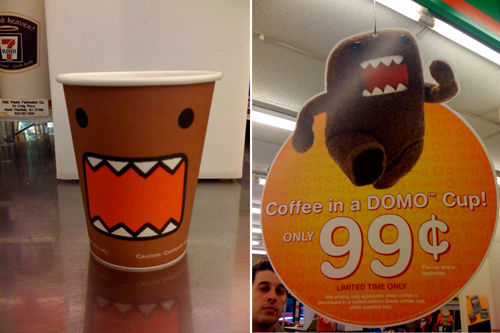 I love the Domo-cup! I wish he was at Target again this year. Look in the cooler at 7-11. Domo's got his own energy drink. My hubby says it tastes like red bull but better because you get the cool Domo can! Not sure which one you were at already; there is one on Lake Ave at Stonewood (right near School 42) in Charlotte. There's one on E. Henrietta Road - past Gro-Moore, on the left. I pass it all the time on way home from pickin up LLC. Can check there for you next week. 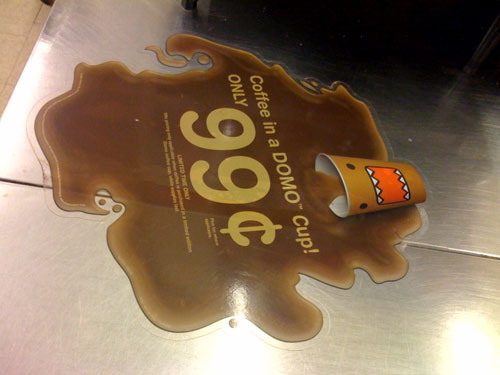 I was at the Monroe (near Meigs) 7-11 the other day, saw the Domo material & figured you already knew about it! The one by Clinton & Elmwood may also be accessible/helpful in your quest.